My curated collection of visuals! Browse sample main lesson book pages, watercolor paintings, chalkboard drawings, etc. for Botany. There is a lot of content to cover in Botany, so this is can be done as one block or two. If you prefer one block, I would suggest only using my first block's notes (below). If you prefer two blocks, you can use the Thomas Elpel materials to go into more detail. This second Botany block can be done in 5th grade or 6th. Please do note that these resources are for teaching Botany in North America. A lot of options here, but I strongly recommend going with Michael J. Caduto and Joseph Bruchac's Keepers of Life: Discovering Plants through Native American Stories and Earth Activities for Children, plus Thomas Elpel's excellent plant identification resources: Botany in a Day: The Patterns Method of Plant Identification, Shanleya's Quest, and the Patterns in Plants Card Game. Donna Simmons's original Botany block suggests that you purchase her book, plus Eric Fairman's Path of Discovery volume 5: Grade 5, Keepers of Life, and The Living World of Plants: A Book for Children and Students of Nature by Grohmann, although she notes that this book may seem strange to some since he is an anthroposophical botanist. Week 1 - What is a Plant? Day Two - Finish up from yesterday; copy 'Conifers'; independent reading: Discover Nature Close to Home "The Pine Family"
Day Three - What is a Flower? - Grohmann pp.11-18 and p.63 on; parts of a flower - talk about and draw - cut sunflower head in half (down the middle) and examine; independent reading: Discover... Wetlands "Butterflies"
A perfect read-aloud for this block is The Evolution of Calpurnia Tate by Jacqueline Kelly. Lovely poems to memorize, or to add to the MLB, are "Trees" by Sara Coleridge, p.135 OR "Plants" by Johann Wolfgang von Goethe, p.138, both of The Waldorf Book of Poetry. eat some honey straight from the honeycomb! great mnemonic device to help remember the order of the taxonomic hierarchy! 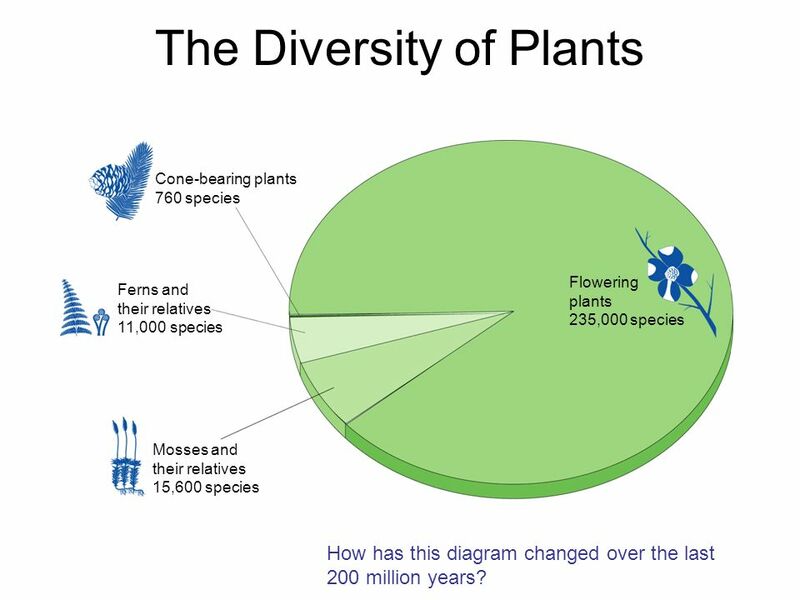 fascinating pie chart for The Diversity of Plants! Becca converted this pie chart to a bar graph (her decision... she thought it would work better) and used it as her MLB illustration. She was right. It's quite a dramatic visual! We did this with 1/4 inch graph paper. 1 square = 6000 species. You can also make a design (or write your name) on a grassy lawn by cutting large shapes out of cardboard, placing them on the grass, and weighting them down with stones. Leave undisturbed for a few days and then lift them up. Your design should be "written" in yellow. Don't leave the shapes on for too long, though, or you'll kill the grass! We probably would have done "Alluring Algae" except that we didn't need to. By sheer luck and outrageously good timing, we had just spent two weeks setting up an aquarium, collecting pond water and plant life and tadpoles, and watching the drama of an ecosystem unfold in our living room. We only expected to find the tadpole-frog metamorphosis interesting but actually all that was going on in our tank -- plant and animal -- was fascinating! Dennis Klocek gives suggestions for crayon, watercolor paint, construction paper collage, and modeling beeswax. I had Becca use golden modeling beeswax to make a Rockweed before drawing it in her MLB. another great image of mushroom anatomy! we used king trumpet, portabella, brown beech, and skiitake (all from the grocery store) and got nothing, but when we picked a mushroom from the wild it made a beautiful print! Botany is a really good subject for bringing in special guests: grandparents, neighbors, etc. with knowledge of Horticulture. Becca finished this block with her grandmother -- my mom -- who came to visit us for a week. What a special treat for the both of them! We also visited a small new botanical garden near us: the lovely Mandala Gardens in Marion IL. We do not need to highlight Medicinal Herbs in this block because the children in our homeschool co-op have a Medicinal Herbs class every week with the master herbalist at Dayempur Farm. However, one great resource for this is the cooperative board game Wildcraft... my kids love it! I also recommend the excellent books The Healing Power of Herbs: Medicinal Herbs for Common Ailments by Tina Sams, The Herbal Medicine Cookbook: Everyday Recipes to Boost Your Health by Susan Hess and Tina Sams, and the Herbs with Rosalee website (herbalremediesadvice.org). patterns of the Mint Family illus. patterns of the Mustard Family illus. patterns of the Pea Family illus. patterns of the Aster or Sunflower Family illus. There are other botanical families, if you want to continue to explore past the end of Shanleya's Quest. Some of these are the Borage Family, the Heath Family, and the Ginseng Family. Another interesting option is for the teacher to take the online course Learning the Language of Healing Plants, a 12 session webinar series presented by the Physicians' Association of Anthroposophic Medicine (PAAM). The Year One videos include Yarrow and Dandelion, Peppermint and Daisy, Birch and Primula, Pulsatilla and Fragaria, and Chelidonium and Chamomile. Videos are available separately without one having to take the entire course. They are approximately an hour long and are $15.00 apiece. The Year Two videos will explore Plantain, Horsetail, St. John's Wort, Elder, Lime (Linden), Thistle, Coneflower (Echinacea), Lemon Balm, Rosemary, Rose, Gentian, Arnica and Calendula (Arnica and Calendula will be looked at as a pair). The Year Three video list has not yet been provided. The textbook for "Learning the Language of Healing Plants" is Healing Plants: Herbal Remedies from Traditional to Anthroposophical Medicine by Markus Sommer. The Agriculture Course (available free online at the Rudolf Steiner Archive) is also recommended as additional reading. If you didn't purchase the Leaf Chart from Nienhuis Montessori for the first Botany block, you might want to get it now ($30.00). Another excellent way to spend your 6th grade school year doing Botany is to take up the work in New Eyes for Plants: A Workbook for Observing and Drawing Plants. Simply use this book as the curriculum for your drawing lessons. Margaret Colquhoun has written an amazing book which blends Science and Art and takes you through the cycle of one year. Very highly recommended! "Plant in the Rainbow Colors" aka Watercolor Painting Outside!